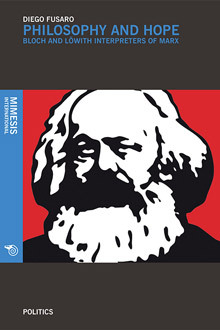 One of the greatest unsolved issues that Karl Marx bequeathed to his interpreters concerns the legitimacy of practical and theoretical hope, both in the frame of his thought and in the wider horizon of philosophy. The entire Marxian work seems to be enigmatically suspended between the opposite dimensions of science and hope. The interpretative lines chosen by Ernst Bloch and Karl Löwith see in Marx a philosopher of hope more than a philosopher of science; and these reflections recognise the inevitable utopian tension in relation to which science is a secondary and functional phenomenon. They both claim that hope is at the heart of Marx’s thought; however, given the antithetic views about this feeling held in their philosophical reflections, they end up with an opposite evaluation of hope. Diego Fusaro (Turin, 1983) is an attentive scholar of the philosophy of history and the structures of historical temporality, with particular interest for the thought of Fichte, Hegel, Marx, Gentile and Gramsci, as well as for German “conceptual history”. He recently published Europe and Capitalism. Regaining the Future (Mimesis International). He is also the editor of the internet project “La filosofia e i suoi eroi” (www.filosofico.net).